On the eleventh day of Christmas, Australian Bush Flower Essences gave to me… Alpine Mint Bush (Prostanthera cuneata). Today we will take a look at an Essence that is most helpful this Christmas if you are the sole carer for an elderly parent, a family member with a disability or if you work professionally in aged care or nursing. While many people are getting ready to take a break between Christmas and the New Year, if you are a carer, you obviously cannot just abandon your responsibilities because it is Christmas. So for sole carers of anyone (and that includes mothers and fathers of young children), Alpine Mint Bush Essence is the present you most deserve under your tree this Christmas. As a carer, this Essence really needs to become a regular part of your health and maintenance regime. It is very important to help bring about the emotions that ensure that you, as a carer, do take the time to replenish yourself, take the time out that you need to rest and recover and know that helping others is not meant to be at the expense of your own health or happiness. 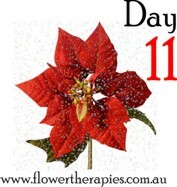 How can Alpine Mint Bush Essence help you as a carer this Christmas? Create personal time for yourself this Christmas: Alpine Mint Bush Essence is the perfect remedy to help you realise that you deserve, and need, to take time out for yourself. For many carers, one reason they don’t take time out is the difficulty they feel they will have in finding a replacement carer for their charge. Another reason is because they feel guilty that they are wanting the time out, and they hold the damaging belief that they should not be as selfish as to need time away from their responsibilities. But whether it be appealing to another family member, engaging professional respite services or scheduling annual leave with your manager, this Essence will encourage your need to find regular ways to take time out from your duties (after all, you are no good to anyone if you allow yourself to get sick due to overwork, poor nutrition and lack of sleep). Bring joy to yourself, as well as to the world: For many carers, their main focus in life is to care for others. But for the professional carers I have personally taught in my classes, the concept of caring for themselves seems quite foreign and for some, almost selfish. This attitude has most likely built up over years of viewing the importance of their professional duties to society, but in return has somehow diminished their own sense of caring for and about themselves! Alpine Mint Bush Essence ensures that as a professional or home carer you make it your priority to care for yourself, as much as you do for others. Revitalise and refresh this Christmas: There can be no better season to take some time out and really do something that is just for yourself (even just a small thing, if time is really scarce for you). Alpine Mint Bush Essence ensures that you will realise the importance that taking time out will bring to your life and will reduce the chance of becoming resentful when your needs aren’t being met because all your time is being spent caring for others. As a wonderful bonus, you will realise that after your break, you are more effective, more generous and more efficient for your charges, so they will thank you for looking after yourself as well! I like to think of this Essence as the Australian version of creating a ‘White Christmas’, since we are enjoying summer at this time of year, and this plant grows in the alpine regions of our country that do see snow in the winter. And since winter is normally a time to slow down, take care of yourself and look at your life a little more, Alpine Mint Bush Essence can help you to do all this – regardless of the season you are in! It can help you to put your cares into the hands of someone else in order to give yourself the respite needed to be healthy and have time for your own life – while still fulfilling your responsibilities to others. While it is important and necessary to be of service to others, you also need to learn to be of service to yourself, by taking good care of yourself. After all, if you don’t, who will? I hope you will join me for the very last installment in this series tomorrow, when we look at the last of our ’12 Essences of Christmas’. I am a ten year user of this great Bach flower essences, it is an effective mood enhancer and have a calming effect too. I had also notice no side effects even if I used it often, the more effective and potent its actions. Thanks so much for your wonderful comments and lovely to meet another flower essence user! The Australian Bush Flower Essences (like all flower essences) are indeed self-adjusting, so there are only bonuses to be gained by taking them!